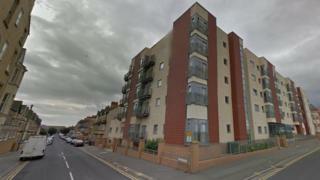 A man is in an induced coma in hospital after suffering knife injuries to his chest during an alleged attack in Rhyl, Denbighshire, a court has been told. It is understood Anthony Hunter suffered a puncture wound in the incident that took place on Butterton Road in the town on Thursday afternoon. A second person, named as Carl Grocott, also sustained a leg injury. A 32-year-old man from Denbigh has appeared before Llandudno magistrates charged with wounding offences. He was remanded in custody to appear at Mold Crown Court in August. Five other people were arrested following the incident, but later released by North Wales Police. Officers said on Friday they were continuing to appeal for any witnesses in the Butterton Road area between 12:55 and 13:30 BST on Thursday to contact them.